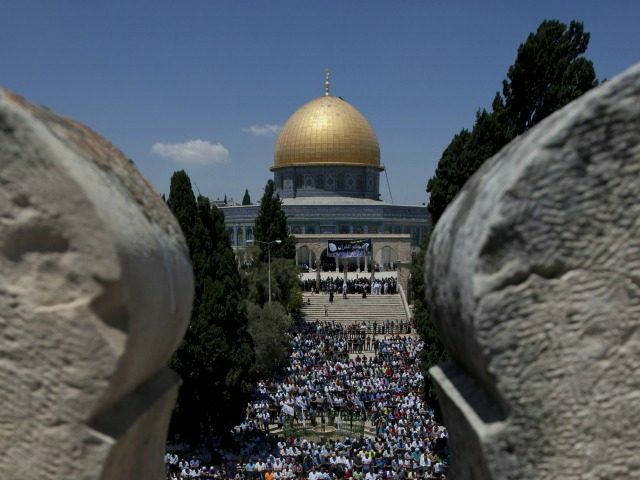 TEL AVIV – Israel will gradually reopen the Temple Mount complex to Muslim worshipers on Sunday while adding additional security precautions after the site was closed following the murder of two Israeli police officers by three Arab-Israelis on Friday morning. Prime Minister Benjamin Netanyahu made the decision Saturday evening after a conversation with the heads of the police, the Shin Bet and Internal Security Minister Gilad Erdan. “I held a discussion with the top security leadership, and I instructed that metal detectors be placed at the entrance gates to the Temple Mount. We will also install security cameras outside the Temple Mount, in a way that gives us almost complete control over what goes on there,” Netanyahu said in a statement on Saturday night. On Saturday night, three Waqf officials were under arrest on suspicion of assisting or encouraging the gunmen who shot Druze police officers Haiel Sitawe, 30 and Kamil Shnaan, 22, Channel 2 reported. According to the report, the three gunmen received assistance in stashing their weapons within the compound days before the shooting. Israeli police forces scoured the compound for weapons over Friday and Saturday. Israel has in the past proposed installing cameras around the compound, a move that Jordan has opposed. However, according to Ami Meitav, the former Shin Bet security coordinator for the Old City of Jerusalem and the Temple Mount, this time it was Jordan that asked for cameras to be installed. In a call with journalists, Meitav said that Israel had refrained from installing the cameras out of “respect for the Muslims who come and pray.” Meitav added that installing metal detectors is not an ideal solution since the Friday worshipers reach into the thousands. “It’s not simple at all. You cannot check more than 2,000 people that come to pray on Friday,” he said, adding that while security forces may not check each individual, just the fact that security is significantly beefed up will deter people from coming to the compound with weapons. Public Security Minister Gilad Erdan also said that metal detectors would present several challenges. Israeli security officials searched religious and administrative buildings on the Mount over the weekend and briefly detained several employees at the scene during the attack. All the searches were carried out with cooperation from members of the Waqf, said Jerusalem’s police chief Yoram Halevi. Netanyahu also intends to bar visits to the contested site by Jewish and Arab MKs for the foreseeable future, Channel 2 reported on Saturday. A current ban on such visits had been scheduled to expire later this month. Palestinian Authority President Mahmoud Abbas also condemned the shootings but warned of violent ramifications if the Temple Mount were to remain closed. His ruling Fatah faction called the closure “deplorable” and urged Muslims to go to the Mount. Netanyahu called on Abbas to stop the mass call to prayer and to prevent any further escalation. All three of Friday’s gunmen came from the Israeli-Arab town of Umm al-Fahm and did not belong to any terror group. Hamas praised the attack and called for more after Israel closed the Temple Mount.